The CS110 is used for lightning warning applications and in research applications for measuring the local electric field. It measures the vertical component of the atmospheric electric field at the earth's surface. The CS110 sensor is typically part of a larger electric-field system. It includes an integrated CR1000 datalogger, and so can be expanded with the addition of other sensors and peripherals. Note: For a complete system that uses the CS110 Electric Field Meter Sensor, refer to the LW110 Lightning Warning System page. See how one of our systems is helping keep events at Utah schools safe from lightning on KSL.com. The CS110 uses a reciprocating shutter instead of the traditional rotating vane field mill. The reciprocating shutter is electrically connected to ground potential by a flexible stainless-steel strap. The strap operates below its fatigue limit, resulting in an ultra-reliable electrical ground connection to the shutter. The reciprocating approach provides better low-frequency error performance than the traditional rotating vane field mill because it has a convenient zero-field (closed shutter) reference. The zero-field reference allows the CS110 to measure and then correct for electronic offset voltages, contact potentials, and leakage currents of each individual measurement (Patent Pending). The CS110 also contains circuitry to measure and compensate for insulator leakage currents occurring on the charge amplifier input, eliminating measurement errors caused by fouled insulators. If insulator surfaces become conductive because of surface contamination, a leakage current compensation circuit applies an equal and opposite polarity current to the charge-amplifier input that prevents saturation of the electronics. The CS110 has a one year warranty against defects in materials and workmanship. Campbell Scientific does not warrant that the CS110 will meet customer’s requirements or that its operation will be uninterrupted or error-free. Atmospheric or local electric field conditions or different site characteristics may cause false information, late data, or otherwise incomplete or inaccurate data. The CS110 only measures conditions that make lightning more likely. Just as with weather forecasts, the CS110 measurements only help assess the probability of lightning. Lightning can occur causing personal injury, even death, or damage to property without any warning from the CS110. Campbell Scientific is not liable for special, indirect, incidental, or consequential damages from the use, failure, or malfunction of the CS110. A full statement of the CS110’s Warranty is contained in the CS110 Manual. -NOTE- An embedded CR1000M datalogger module (ordered as pn 18292) is required for every CS110 purchased; see Common Accessories section on Ordering Information page. -NOTE- Refer to the sensor manual for resolution, sensitivity, and noise specifications. An embedded CR1000M datalogger module (ordered as p/n 18292) is required for every CS110 purchased; see Common Accessories in ordering information. Generally, the CS110 should be run with the latest released CR1000 operating system (OS) available via "Support" on this website. However, CR1000 OS version 27.05 should NOT be downloaded to standard CS110s. OS version 27.05 was built to accommodate the ~40,000 v/m efields measured on ocean buoys. The special OS also requires a capacitor change on the CS110 panel board. The internal CR1000M (required) can be interfaced to another data logger via the Power/SDM cable if the application requires an additional data logger. The CR1000’s on-board programming language, CRBasic, provides data processing and analysis routines that support user control over sample (measurement) rates and setting of alarm conditions. LoggerNet Datalogger Support Software facilitates programming, communications, and data retrieval between the CS110 and a PC. The CS110 has sealed connectors for attaching meteorological sensors and three digital control ports for controlling external devices and/or triggering alarms. The embedded CR1000 datalogger measures the sensors, processes the measurements, stores the data in tables, and can initiate communications. Communication options compatible with the embedded CR1000 include direct connect, Ethernet, phone modems (land-line and cellular), radios, short haul modems, GOES satellite transmitters, and multidrop modems. The 17642 Zero Electric Field Cover (ordered separately) is used to check the electric field offset voltage of the CS110. If the measured electric field is ≥|60 V/m| with the Zero Electric Field Cover on, then inspection and cleaning of the electrode surfaces is recommended. 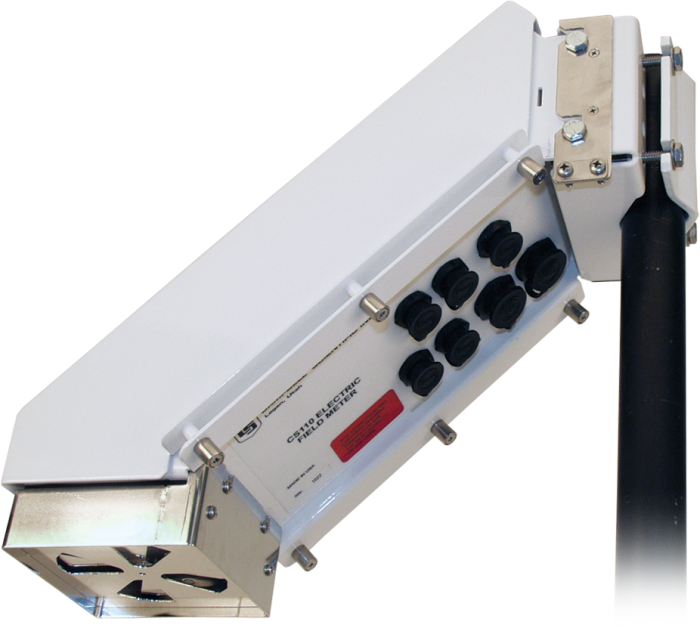 The SG000 (ordered separately) can be used in conjunction with our CS110 to create a complete lightning-threat measurement and analysis system. This system combines the advantages of two complementary lightning-warning technologies. The SG000 reports actual lightning strikes occurring at distances up to 20 miles—providing a comfortable warning time for incoming storms. The CS110 reports electric fields associated with local thunderstorm development—providing a warning prior to lightning strikes. Can a CS110 be used to measure current flow and direction on electric transmission lines? When programmed as a “Slow Antenna” sampling at 100 Hz, the CS110 would provide polarity information but not actual current flow in the wire; therefore, Campbell Scientific does not recommend using a CS110 for this purpose. If a CS110 electric field sensor is installed in complex terrain, such as on a ridgeline in alpine territory, what is the effective range (spatial range) of the instrument, and how might it differ from a flatland site? Thousands of miles: When there are no clouds in the sky, the CS110 responds to what is called the fair weather electric field created by the “global electric circuit.” Thunderstorms worldwide transfer charge to the upper atmosphere, which comes down worldwide as an electric field that varies from roughly -100 to -200 v/m on flatland sites. Our customers have indicated that the fair weather electric field is enhanced by high terrain. Interestingly, there are daily and seasonal changes to this global electric circuit. 20 miles: Lightning strikes in thunderstorms as far as 20 miles away are discernable in the fair weather electric field from a flatland site. The strikes show up as sharp changes in the electric field followed by a more gradual recovery. It is unknown if the distance is greater on a high ridgeline. 5 to 7 miles: When charged clouds are within five to seven miles, they can positively or negatively change the electric field above or below the fair weather electric field. Even when the actively producing cloud-to-ground lightning portion of the storm is 20 miles away, an anvil cloud from that storm that comes within five to seven miles of the CS110 will change the electric field measured by the CS110. Think of clouds attached to an active thunderstorm as electrical conductors. Even anvil clouds that were once part of a thunderstorm that has since dissipated will hold their charge for a significant period. A mountain between a charged cloud and the CS110 will block the electric field influence that the cloud would have had on the CS110. For more information on this topic, refer to the “Cumulonimbus” section (section 3.2) of the book Lightning: Physics and Effects by Vladimir A. Rakov and Martin A. Uman. Are there any problems with locating a CS110 Electric Field Meter Sensor and an SG000 Strike Guard Lightning Sensor near a tower that has spread-spectrum radios on it? The CS110 and the tower should be positioned away from each other a distance of three times the tower’s height. If the radio signal is strong enough, the SG000 may pick it up as one of the two components the SG000 measures to detect lightning. If this signal coincides with a light flash from a windshield or headlight, it could generate a false strike signal. Also, constant bombardment of the SG000 by sufficiently strong RF signals will pull the sensor out of its quiescent state, affecting its current drain. This will eventually degrade the battery and shorten its expected four-year lifespan. Do the inputs on the CS110 panel board have the same (or better) surge protection as the CR1000 wiring panel? The CS110 uses the same gas discharge tubes, etc., so it provides similar surge protection as the CR1000. The ground paths are different, although both are intended to provide a good ground path through the ground lug on the wiring panel and the case ground hardware on the CS110. How can an end user simulate a lightning strike to an SG000 or CS110? To simulate a lightning strike to the SG000, use a camera flash to flash the glass bulb from a distance of 5.08 to 7.62 cm (2 to 3 in.). Note: A flash from a cell phone usually isn't large enough to simulate a lightning strike. To simulate high electric fields on the CS110, run a comb through your hair and hold it a distance of 2.54 to 5.98 cm (1 to 2 in.) from the shutter of the CS110. Other items such as plastic bags or balloons, or fur on glass, can be used as well. What is the FC100 commonly used with? The FC100 is required to communicate with the SG000 Strike Guard Lightning Sensor. The SG000 is an option for the CS110 Electric Field Sensor and the LW110 Lightning Warning System. The CS110 Electric Field Sensor, and field mills in general, are referred to as induction probes because the applied electric field induces charge onto sense electrodes. The amount of charge induced by a given field depends on the voltage at which the sense electrode is at. Normally, it is most convenient to ground the instrument, making the sense electrode at earth ground potential when measuring the vertical component of atmospheric electric field at the surface of the earth. This is because the instrument then appears to be an extension of the earth ground. For example, in a flush-mounted upward-facing configuration with the instrument earth grounded, the imaginary electric field lines will terminate on the instrument as if it were an extension of the earth ground. Negligible field distortion occurs at the instrument aperture, as if the instrument were not present. This configuration mimics the parallel plate factory calibration done on the instrument and is why a flush-mounted upward-facing configuration is used for site correction of inverted and elevated configurations. The instrument can be connected to other voltage potentials besides ground, or left electrically floating, although the measured results will differ because of the change in voltage between the instrument and the source of charge generating the electric field of interest. The closer the instrument voltage potential is to the voltage of a source of charge generating an electric field to be measured, the less there is an induced charge on the sense electrode. For example, if an induction probe was placed next to, and facing, a large conductive sheet that was at some voltage with respect to earth ground, and a voltage of the instrument was varied by means of a connection to the CS110 ground lug, it would be possible to adjust the instrument voltage until zero charge was induced on the sense electrode from the nearby sheet. For this to occur, the voltage applied to the induction probe would need to equal the voltage applied to the large conductive sheet mentioned. This approach can be used to determine the voltage of the sheet and is referred to as a non-contacting voltmeter. The CS110, or any induction probe for that matter, can operate as a non-contacting voltmeter with the addition of the adjustable supply.